Teaching and learning are transitioning from traditional classroom-based approaches to computer-based learning environments. The demand for technology innovations generate from the new student generation who was born into a technology-driven era termed digital natives. While a large majority of current teachers come from a less technical generation termed digital immigrants. A teacher cannot reap the benefits of online teaching approaches if they are not trained on how to convert traditional methods to online learning and do not understand the available technologies. 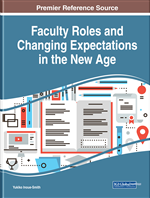 This chapter covers e-learning paradigms, e-tools, and e-assessments for converting traditional approaches to online environments. Self-Learners: Academically committed, interested in the studies, want to excel, have a clear career path, and ask questions to develop a concept as it pertains to personal significance. Job Seekers: Generally, do not have a sound background of prior knowledge needed to excel in the course nor divulged in commitment, often do not ask questions and producing just enough effort to pass the course, to become employable. Body of Evidence: It includes more than one assessment. The primary focus is to determine if the student has met the learning objectives. Flexible Learning: This enables teachers and students to adapt to teaching and learning requirements at any given moment. Students can modify their learning environments to fit a variety of learning styles and activities ranging from individual to group exercises. Academic Commitment: This is a two-way commitment: the teacher is committed to student achievement, and the student is committed to meeting the target objectives. Artifacts: These are representations of work, such as electronic documents, videos, and images. Mobile Learning: This is a way of obtaining education or training by using mobile devices such as smartphones or tablets. These devices may access educational content on local storage, over the internet, or combination. Bloom’s Taxonomy: Created by Benjamin Bloom to promote higher thinking in the education field, such as analyzing and evaluating concepts, rather than just remembering facts. Learning Paradigm: Learning theories are divided into different paradigms which include behaviorism, cognitivism, and constructivism. The learning process relates to the instructional design theory. VARK Learning Model: The acronym VARK stands for visual, aural, read/write, and kinesthetic sensory modalities that are used for learning information. The model is used to identify whether a person has a learning preference for visual (images, diagrams), auditory (lectures, discussion), reading/writing (textbooks, notes), or kinesthetic learning (hands-on).